Resume writing is one of the mandatory and inevitable steps that a job seeker has to do when he/she is applying for a job. The quality of the resume depends on which company that you are applying to. The more famous and well established the company, the more quality your resume must have. Keep in mind that resume will not help you in securing a job but a perfect resume will help you stand out during the filtering process and will secure you a place in the interview. The rest is up to the candidate and how he/she performs. 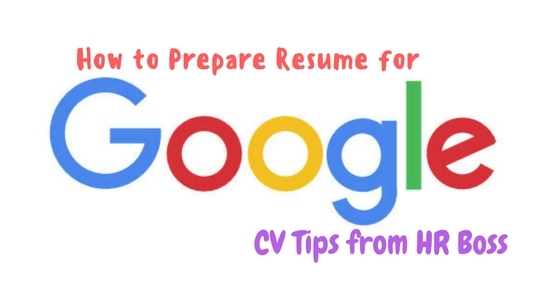 Mentioned below are few tips on how to prepare a resume for Google. Try to include just necessary information needed to be stated. That is, do not try to add information that can cause bias or confusion to the hiring manager. This information includes family details, sexual orientation, gender, residential address etc. Try to leave out such similar information. When writing a resume, only include your email id and phone number or contact number or just a LinkedIn account link. The main aim is to not disclose anything about your family or your personal life. Failure to do so, will land your resume in the rejection pile. Usually, such practices are considered amateurish and needy. Try to highlight your resume by stressing the various skills that you have which are relevant to the position. Also, try to look out for spaces that do not require any detailed information and cut out the needless information and details. This will help your resume look clean and less cluttered. Try to constantly revise your resume and look for any errors or mistakes. Constant checking is essential. Proofread your resume every once in a while, and try to update it with necessary details and try to take out mistakes and typos if any. Try to use simple words that show your skillset and impress the hiring manager. The vocabulary and your writing style should not be too complicated and should give the employer a clear idea about you and your skills and knowledge. Do not try to be too simple, so that it could be easily brushed off. For example: If you have done an activity such as building a website, instead of writing “ I built a website”, try to state the activity as “ I curated a website for catering to the needs of the organisation”. This shows why you created a website and how it affected others. Try to state facts and accomplishments such that equal attention is given to both small and large accomplishments. Also, another factor that depends in the success of the resume is its’ length. Try to build a resume on one page. This is one of the most important points that you should follow while writing resume. Do not try to stretch out and add false details. This might be intimidating, but always try to add honest details and accomplishments that you have achieved. Also, when applying for a site like Google, they always verify what was written in your resume. Whatever information that you have written in your resume, you will be subjected to questioning, verifying and testing. When applying for a company like Google, try to state the resume in such a way that it reflects their core values and objectives. To achieve this, try to go through the various guidelines and understand what the company expects from potential employees like us. Try to add keywords that express the company’s aim and objectives. This will capture the attention of the employer and helps to create a positive vibe about your resume. Tactfully integrate eye catching keywords and vocabulary. Always try to write a resume that prevents it from landing in the rejected pile. There can be many reasons varying from unwanted typos, improper formatting, to unnecessary details. Formatting is the most important process in resume making. Since, most of the employers try to only take a glance at the resumes to save time, try to arrange the details such that it is easily seen and understood by the recruiter. The format should be unique and eye catching, but it still needs to follow the standard format that the company has stated. Try to bullet all the necessary points so that it is easy to read and seek attention from the recruiter. Also, centre your skillsets and try to provide information such that the recruiter gets a brief idea of what your plans and aspirations are, at one glance of your resume. The main purpose while formatting a resume is, try to make it a bit more unique and eye catching. Instead of focusing on your objective, try to state what all you can do to achieve the company’s objective. This shows the selflessness that you can present to the company and help to reach the required goals. While applying for a job at Google, do not clearly emphasize on one job. This a big mistake. Try to apply for more than one jobs that you feel you are confident to do if given the proper training. This shows how much you are willing to work in the company and how much you are able to contribute to a large company like Google. What most candidates do is that, while applying for a company like google, they only send one type of resume for all the different departments that they are applying. This should be prevented at all costs. This is because, as a candidate, you should be able to tailor your skills depending upon the various needs of the company. This shows how versatile you are in your job. Unless you are a newly graduated person, this is applicable for job seekers of all kinds. Also, send thank you notes after an interview. Try to ensure that, while writing your role and responsibilities, make sure that it does not sound like a job description. Always write one sentence for responsibilities and two sentences for accomplishment for easy reading. There are certain factors that you should keep in mind when preparing a google cv. 1. The first thing that google notices are how is the candidate’s general cognitive ability. This means that how well does the candidate adapts to various situations, studies it, and solve problems. That is the candidate should be ready through with basic computer skills. Try to acquire a knowledge set that is irreplaceable and can be used in any situation. This kind of skills are not acquired only through a college degree, they can also be acquired through various skills like problem solving. Analytical analysis is an example of such skill. 2. Another factor that google keeps in mind is which location the candidate is keen on working at. This can be dependent upon a few factors like how good the candidate is at his/her job and how well adapted he/she is at a new place or location. You should have at least a basic skill set so as to work in any location or any field allotted. This differentiates you from the rest of the candidates in the market. 3. Another factor that google keeps in mind is the creativity and logical thinking of the candidate. Since these factors are not easily accessible and they are acquired through systematic learning and hard work, these skills are usually more prioritised than the rest. 4. A great factor that most candidates forget is the application of discipline. Discipline is one of the most forgotten skills that the candidates fails to include in their resumes. Discipline is necessary for incorporating all the said advantages so as to result in a productive output. This is necessary because, this creates a balance within all fields. People who are holistic thinkers and are deep functional thinks, following a set lifestyle is an example. This is necessary since competing within a great society requires a lot of patience and discipline. Try to include the right kind of content in the resumes. It is found in a recent survey that more than 50% of resumes have typos in them. This resume mistake might be due to the poor proofreading and revising of the finished resumes. Though typos are considered to be inevitable, there are methods in which these issues can be fixed. One great method to fix typos is to make another person read your resume. This makes it easier to detect errors since most people who are making their own resumes fail to detect errors since they are not constantly looking at the screens for hours. After thoroughly reviewing the resume, try not to make any more tiny changes, this is necessary as people who constantly make changes are more prone to small unrecognizable errors. Also, try to read the pages from bottom to top instead of top to bottom to find new errors and typos. As per the head of public relations of Google, Mr. Lazlo Bock, a good rule of thumb is a full page for every 10 years of experience. A crisp and defined resume helps to make, convey and prioritize the most important information about a person. As stated earlier, a resume should not extend more than 2 pages. Also, keep in mind that a resume should not be a statement or a chronicle of all the accomplishments and goals that you have achieved. A good resume should be considered as a marketing document which is necessary to show that you are fit for the applied job and why you are deserving for the job. Try to include details that really matters and cut the unnecessary part accordingly. 3. Mistake 3: Too much creativity. It is a known fact that substance matters than looks when writing a resume. Usually, recruiters prefer to see a simple, detailed and a perfectly formatted resume rather than a stylish and an overly creative one which is tough to read. When you have time, try to make your bullet points sharpened rather than making them look great. Make the content more interesting to learn rather than making it more stylized. Make sure that the form and the formatting look great and the same, no what type of program it is opened by. A good method is saving your documents in a PDF format rather than a .docx format so as to prevent any formatting in the future. 4. Mistake 4: Confidential information. Try to maintain a confidential relation with your previous company. Even if you have left the previous job, it does not mean that you have the right to share confidential information to the future employee. This creates a sense of distrust within the employer. And there might be chances that the candidate will be rejected easily. The simplest way to prevent such a risk is to not include such confidential details or any kind of information that should not be shared. Try not to lie about various factors such as school grades, college CGPA and essential details like where you completed your degree from and how many years you worked in your previous company and what all projects that you undertook and so on. Do not include any false materials or untrue information.Try to keep in mind that these mistakes are pretty avoidable if you spend a good amount of time and attention to these things. Make sure that your resumes are on point and you can be ahead. Try to keep in mind that these mistakes are pretty avoidable if you spend a good amount of time and attention to these things. Make sure that your resumes are on point and you can be ahead. Previous articleHow to Make your Goals and Wishes Come True?